Last night I was talking to a friend about my post from yesterday. Somehow it developed into a discussion on guns, and I shared that I have never, in over 40 years, touched a gun. Never held one in my hands, never fired one, and certainly never pointed one at a human being with the intent to hurt or kill. I have seen them certainly, having grown up on the prairies, but my urban life has never included guns. This same friend and I also discussed the white poppy controversy, and how it has become a point of contention as those who don the white poppy say they are avoiding the red poppy as it "celebrates war". 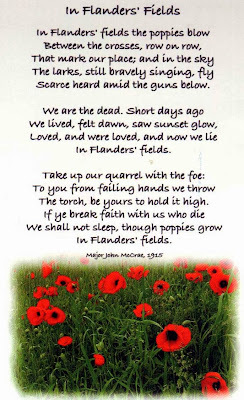 I didn't see the connection between my never touching a gun and the red poppy until early this morning when I woke out of a sound sleep and suddenly realized why I wear the red poppy - and it's not because it celebrates war. It isn't even solely to remember those who fought and died for this country. It is because those who lie under crosses and headstones far from home under a sea of waving red poppies have given me the freedom to never touch a gun. You see, they fought for me so I didn't have to. I would consider myself a pacifist. I believe in peaceful resolution of conflict, and I believe in peace as a concept. I also know, however, that on occasion there are things that are worth fighting for. I know that on very rare occasion there are even things worth dying for, because those concepts - freedom, democracy, and human rights - are ones we cannot take for granted as there are those who would abuse them. I think it is so easy for us to revise history. We think about wars of the past and they cease to even be real in our heads, and we can't even imagine what those days must have been like. Last night my friend and I talked about it, trying to imagine being in a trench for days, waiting to kill or be killed, and the fear that must have been so real you could taste it. We talked about how it must have felt to go to war, to ship out to a foreign country and not know if you would ever return. 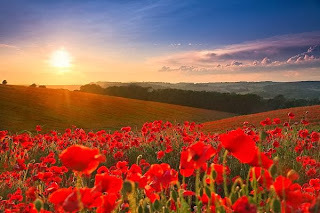 And we talked about white poppies and red poppies, because we have the freedom to discuss such things and to explore these ideas...because someone, somewhere, died for us to be able to talk freely, engage in open dialogue, and even think about white poppies versus red. A long time ago people in the country where I claim ancestry wore a different badge on their lapel. They wore a gold star. This was not a choice for them, and there was no option of gold star versus black or any other colour. They were forced to do so because an evil regime had taken power, and they were being singled out to bear the blame for all that the regime thought was wrong. They wore that gold star until they traded it in for tattoos that identified them, and then, for millions of them, mass graves where they would never be identified. I recall once in Toronto when I was at dinner with an older Jewish gentleman. His sleeve slipped up, and for the first time in my life I saw one of those tattoos, a sequence of numbers inked on his arm. I raised my head and looked into his eyes and all he said was "I was just a child, I don't really remember it much", and yet I could tell from the look in his eyes that he remembered every damn thing that happened to him in that horror. This was not some distant past to him, but a memory as fresh and clear as mine from yesterday. You see the red poppy doesn't celebrate war. I don't believe anyone celebrates war, actually. I think we acknowledge it may be necessary, and I think at times we understand why it has to happen, like when we glimpse a series of numbers tattooed on a dinner companion and suddenly realize that what is simply a history lesson for us was real life for them. We wear red poppies to remember those who willingly and freely gave their lives so no one was ever forced to wear a gold star ever again, so no one was ever tattooed like cattle ever again, and so no one would end their precious life in a gas chamber. 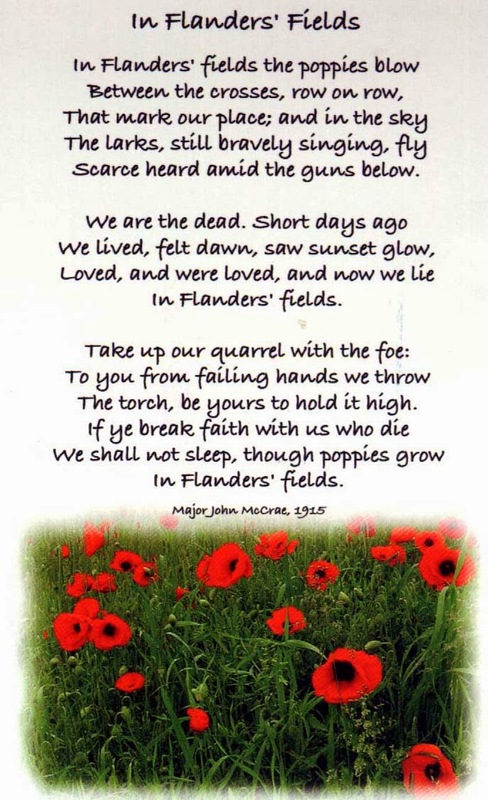 We wear red poppies to remember all those who never came home, and all those who came home forever changed by the experience of touching a gun, and firing it at another human being. We wear the red poppy because we have a choice to do so, because we can even discuss wearing a different colour, because others fought and died for our right to make such choices. 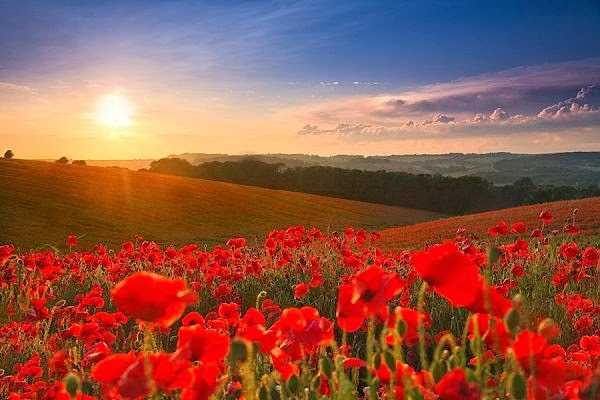 We wear the red poppy because in Flanders field the poppies blow, between the crosses, row on row - crosses marking the lives of those who fought and died so we could make the choices we make every single day, including whether or not we wear a red poppy, or white. I have never touched a gun, I have no numbers inked on my arm, and I have never been to war. And that is why my poppy is red - and it always will be. Well spoken Teresa.I recall a 3rd year paper I did back in university on WWII for which I had to interview a vet about his experiences at Dieppe. Definitely an eye-opening experience. He talked at length of how he felt lucky he wasn't taken prisoner. I kept thinking of how he didn't mention much about being wounded 6 times over the course of all the action he saw. For him, it was more about being their for his fellow soldiers and getting a job done rather than his own physical comfort. Wow, Theresa, these same thoughts were swirling through my head this morning as I was thinking about why my emotions are always so close to the surface on Rememberance Day. I thought of a classmate, the daughter of Concentration Camp survivors and their tattoos and the impact their suffering and damaged spirits had on her life and mine. The profound sadness that infused them. Your words about peace and pacifism moved me deeply because I too am a pacifist who has to reconcile that philosophy with her belief that some things are still worth fighting for and my profound respect for those who choose to Serve and Protect and those who gave their lives for us. I believe we should never forget, history cannot and should not be revised. The cost of freedom is too high.